I don't know what came over me, but I planted a real live garden yesterday. Maybe the mild success I've had with sewing went to my head. Or maybe it was seeing posts of some of my good friends who were literally enjoying the fruits of their gardening labor. But, I really do think that there is a part of me that does long for that simple grounded connection of the pioneer woman spirit. And plus, it appears that now it's even my patriotic duty according to Uncle Sam. It is a bit unsettling to realize that we're actually not too many decades away from most everyone in rural cities having some sort of garden. 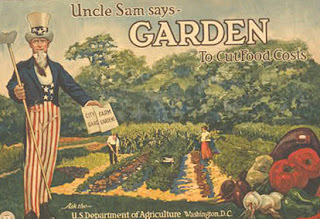 And, even city dwellers had community gardens or were closer to where their local produce came from. I really do think that gardening and growing is in our genetic make-up in some manner. I also have to admit to really liking the idea of saving some money by supplying our own produce rather than paying for it at the store. So, with all that on my mind, I took the plunge on Tuesday and went out and bought a bunch of stuff. The Orchard Supply guy didn't know what hit him. I pretty much said, "Hi. I'm a garden novice. I don't know anything about anything. Please help me." And he did. An hour and $80 later, I walked out with several plants and herbs, a "sweat" hose and timer, a shovel (ours was misplaced), gardening soil, plant food and tomato cages. I put them all in the backyard on the perfect plot of land for a garden in our backyard -- a tiny stip of unused dirt on the north side of our house. It was like it was meant to be. By now, it was dark, but I still enthusiastically watered them with flashlight in hand and thought about what I would do with them the next day. Wednesday dawned and I got nervous about my planting ability and whether I could pull it off. So, I called in the big guns -- a.k.a, my friend Stephanie, whom I call "garden guru." She came over and confirmed what I started suspecting...my perfect plot of land didn't get enough sun. ﻿﻿ We walked over to the south side of the house where things are sunnier. She recommended I plant my garden there. Thankfully, last fall, I had removed all the river rock that had filled both sides of the sidewalk, so it was open and ready to go. My only hesitation was that it's where most of the traffic from the front comes (gardener, trash cans, etc.) So, I had to do a bit of moving things around. Before I really got to work moving things and "tilling the ground." After I removed the landscaping bricks on both sides of the sidewalk, I moved the trash cans to the other side by the house and then got busy turning over the soil next to the fence. Stephanie showed me how to really dig my shovel down deep and then turn over a heaping shovel full. I did this for the entire bed. With some advice from Steph on where to potentially plant the tomatoes, I started them at the far end of the bed so I could move around them to harvest. And then basically I just started planting things as it made sense logistically and as the directions dictated on the plastic stake in the plant. My kids helped some. They enjoyed the shoveling and helping put the plant in the holes I dug. They really like putting the seeds in the ground and covering them up. There were some times I had to shoo them off so that I could get something done and not worry about them trampling it. And about 3.5 hours after I started (stopping for various things, not continuous), I was done. After I got everything planted, I got the "sweat hose" in position and then turned it on with the timer. It worked well, but seemed to make some pools of water in undesirable places. I was able to build up some of the bed so that plants didn't get waterlogged. On Stephanie's advice, I may dig some trenches to allow the water to sit and then seep down deeper. I also ended up planting the strawberries on the opposite side of the sidewalk to get the full sun. I found that when I turned on the hose, a lot of water pooled on this side. So, I dug a trench from the facet down to the strawberry plants and now they will get water when I turn on the house for the other side. Genius, if I do say so myself. Time will tell, though. My strawberry plants. I think I might get one or two more. I am also going to plant some potatoes. Stephanie told me that her grandfather plants them buy cutting out the eyes of potatoes that are starting to turn (with some chunk of potato underneath). You let them dry out for a few weeks and then you plant them eye side up. So, I'm excited to see what will come up and how much it will all yield. I am super excited for the first tomato since I loooove garden fresh tomatoes. Add a little oil oil and some fresh oregano or rosemary...mmmm! Mmmm...tomato love...I made sure to add the cages early as I have been told by many. I'm hoping I'm up for the added responsibility though. With four kiddos, I have a lot on my plate already. I woke up to the rain early this a.m. worried my baby garden would get waterlogged. As if I need more to worry about. I'm also a little concerned that my garden will make it with a handsy 2-year-old who greatly enjoyed stepping in the water trenches yesterday. The trick will be to make him understand he shouldn't step on anything in the middle...or better yet, maybe I should chickenwire off the entire area. (as if) I also have a 5-year-old who is desperate for things to grow to pick. She has asked me about 10 times since 5 p.m. yesterday when everything was planted. if it was ready yet. I have the feeling she will be bringing me some green strawberries some day soon. Mmm...I'm already salivating thinking about eating all of that....and yes, the money we can save! So, the next step is to continue watering and watching and then do some fertilizing. My friend, Deborah, offered up some bunny poop (they have one). She swears it's the best fertilizer. So, I'm going to be working with bunny poop soon (he he!). I also want to start composting but need to figure out how to do that properly. I know this is great for gardens as well. http://www.bonnieplants.com/Default.aspx?alias=www.bonnieplants.com/lowes - helpful hints on what to plant, when and how. http://gardeningwithconnie.blogspot.com/?spref=fb - there's plenty of gardening blogs, but I am starting here with my friend, Deborah's sister. I am also getting lots of advice from gardening friends. And actually, we just started a "Gardening Gals" Group on Facebook. Please feel free to share any tips or suggestions!